It never ceases to amaze me to see how far Amazon has come. I can’t remember exactly when I placed my first order with Amazon … wait … that isn’t true! Excuse me while I pull up my account! And there it is – you have to admit, how many sites let you look up a 14-year-old order with what amounted to like 2 clicks? 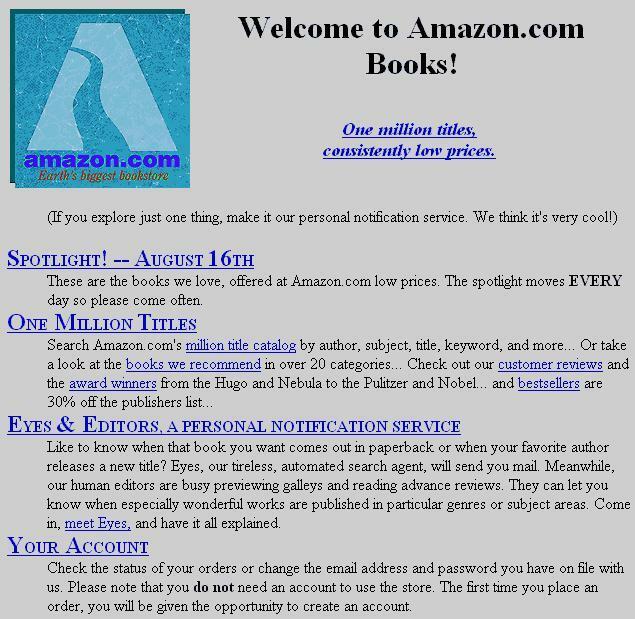 – I placed an order on May 26, 1998 for some books, and it shipped on May 27, 1998. My next order was on June 24, then on June 28 and July 7, so it would seem it didn’t take me long to catch the bug of shopping with the company. Even though I came in around four years after it was founded, I was an early enough adopter that I used to get a thermal mug every Christmas from them. The thermal mugs no longer show up as an unexpected surprise, but I still use the site constantly, and it’s just been oddly rewarding to watch it grow. There really was a time where I thought of it as nothing more than books, and I also got surprised when I would see them add another category. Now I go to the site first for just about anything I’m shopping for. As someone who lives in rural America, and Walmart is about the only choice we have here, I use Amazon probably far more than the average person. Seeing it thrive only makes me happy because I know it will be around next time I need some random item that I can’t find locally, and I know I will be happy to place the order. Seeing it in the news for launching a refresh of its own products this week is awesome. Seeing it in the news because some very old laws got changed that will now see some states paying taxes isn’t quite as awesome. Tax or no, I will continue to use Amazon because, well, oddly enough, my Walmart doesn’t carry Hobnobs from England. Imagine that. Keep it up, Amazon. I’ll keep coming back.